Find out what our experts have to say about KTM RC 390! 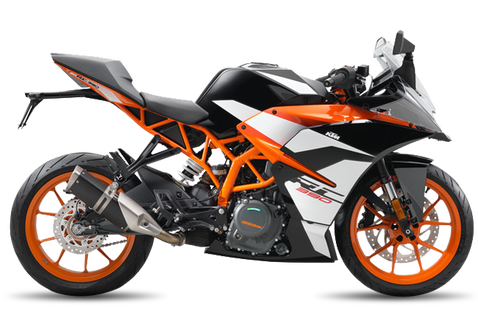 The RC 390 is the full-faired version of the most bang for performance motorcycle on sale in India. The sharp styling will appeal to the youngsters while the sporty dynamics means that the RC 390 is a potent track tool. Choose the KTM RC 390 which fits your bill! Choose the KTM RC 390 which fits the bill of you. KTM launched the RC 390 in the year 2014. It seriously managed to make a mark on the riders with its track focused dynamics. KTM has now introduced the new RC 390, which is comprehensively updated and is technologically advanced than the earlier model. You get a visibly new paint scheme with more orange than black colours. The updated version features new RC 390 badging style, bigger brakes, adjustable levers, better cushioning for the seats, wider mirrors and a side mounted exhaust. RC 390 is a dedicated supersports bike as it is very fast, really powerful and has oodles of power. It competes against the likes of the TVS Apache RR 310, Yamaha YZF-R3 and the Kawasaki Ninja 300. The RC 390 is available only colour option and in only one standard variant too. It is priced competitively at Rs 2.43 lakh (ex-showroom, Mumbai). The new RC 390 may look like the older bike but it is a whole new bike underneath. The new black and orange paint scheme is inspired by the KTM’s MotoGP race motorcycle. The new paint scheme is in glossy finish instead of the matte one. KTM RC 390 bold badging is evident across the body of the bike. KTM has incorporated blinkers into the mirror structure, which look sporty and also contribute to the better aerodynamics. With more bigger and wider mirrors, you also now get a good view of the rear road traffic. The seat is now 12mm more thicker, which provides the rider with an extra seat padding. It is also more comfortable, giving much respite from the stiff ride. The complete digital display of RC 390 has everything you could expect from a state-of-the-art motorcycle, including the current gear indicator, service reminder light, RPM alert indicator, a trip meter, an odometer, a fuel gauge, and a clock too. As the bike is now BSIV compliant, it gets an all-new side mounted exhaust. With the new CAN-BUS system in place, all the wires are now placed in a single insulation which makes for a cleaner appearance. The new RC 390 is setting a benchmark in its class with the new upgrade. The bike runs on the same four stroke, single cylinder, liquid cooled, 373cc engine producing 43PS of power and with a peak torque of 36Nm. Due to the Euro 4 norms, the bike gets a new E-Vap system, which provides better fuel efficiency. It makes the same amount of power, but the throttle response is much more crisper as the bike now gets Ride-By-Wire technology, which is also a segment first. The system understands the power requirement based on sensors for the throttle, while the ECU provides the right amount of fuel and air to the engine. So, without compromising on power, it is easily able to achieve reduced Carbon emission. The aggressive 6-speed gearbox is complemented by the slipper clutch (PASC™ anti-hopping clutch). It also sounds better than the older RC 390, thanks to the new exhaust. Suspension on the bike is handled by 43mm WP upside-down telescopic suspension with 125mm of travel on the front and by WP monoshock suspension with 150mm of travel at the rear. The chances of you scraping the underbelly while leaning into corners is lesser as new exhaust has helped increase the ground clearance. The bike is now more agile and you also get a quick surge in power thanks to the short throttle response. The bike now weighs 147 kgs yet nimble owing to its shorter wheelbase of 1340mm. Braking on the RC 390 is handled by a 320mm four-piston radial fixed calliper disc at the front and a 230mm single-piston floating calliper disc at the rear. You also get the Bosch 9MB two-channel ABS as standard on the bike which increases the safety quotient. The H rated Metzeler tyres provide better grip and come with a speed rating of 210 kmph. Safely stopping the bike is now easy thanks to the disc brakes equipped with dual channel Anti-lock Braking System (ABS) as standard. Safety is increased with the grippy H-rated Metzeler tyres. The BSIV mandate makes the KTM RC 390 feature the Always Headlight On (AHO) too which drastically increases visibility in any weather conditions.